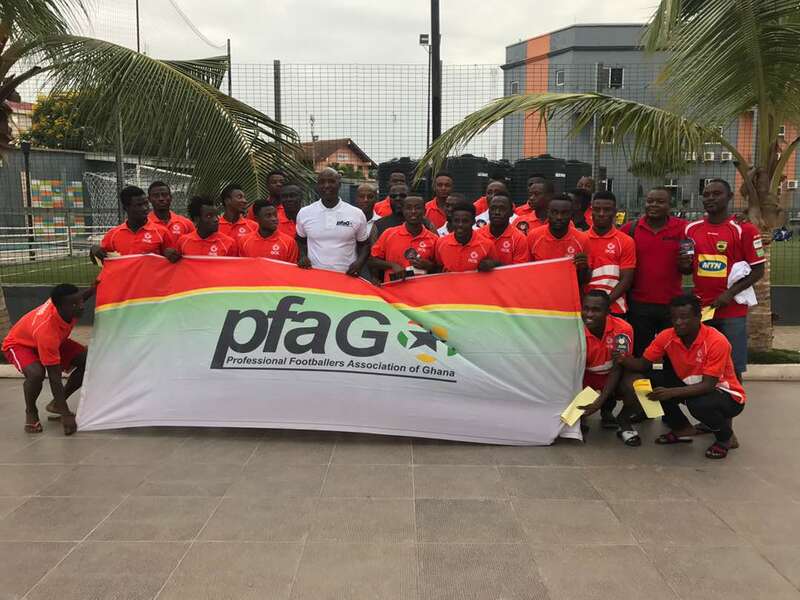 The Professional Footballers Association of Ghana (PFAG) is continuing its educational and familiarization tour of the Premiership Clubs with a visit to the camp of Asante Kotoko Football Club . The Players Union spent a considerable amount of time with Kotoko before the team left for Kumasi after camping in Accra for over a week. General Secretary of PFAG Anthony Baffoe led a powerful delegation which included Solomon Torson, Ibrahim Tanko, Sammy Kuffour, King Osei Gyan, Yusif Alhassan Chibsah and Tomm Krugger, the spokesperson of the players Union. The players were educated on the insurance package for players and advised on how to maximise opportunities earned currently so as to guarantee a better future. The team shared their experiences with the Kotoko team and admonished them to be ambassadors and role models, do more to come out of their current predicament, use dialogue to resolve issues and unite to fight together as a players’ union. Brochures educating players on lifestyles patterns, as well as the do’s and don’ts of a successful career were given to the players. The players expressed their delight at the visit and the motivational speeches given them by the team as they look forward to helping their club and themselves.